Sandy Kurtin’s mobile health application (mHealth app), MDS Manager™, shatters the stereotype that older patients are averse to technology. Together with The MDS Foundation, Kurtin developed The Building Blocks of Hope®, a digital and print tool to empower patients and caregivers living with MDS. The next logical step was to create a mHealth app to allow patients and their caregivers to organize health information that will guide their health self-management. For Kurtin, MDS Manager™ is all about empowering patients to help themselves. “Understanding and engaging in your own care leads to netter health behaviors,” she said. “We put so much of the onus on people to manage their own health without providing the tools and knowledge to be successful. MDS Manager™ allows users to track their lab results, bone marrow results, transfusions, treatments, and any symptoms they may be having.” The app is also a great tool for better preparing patients to go to clinic visits to provide clinical input to health care providers. “Patients don’t have to sit at a computer,” said Kurtin. “With a privacy compliant API interface, the app untethers people, allowing them to access and enter information wherever they are on a smartphone or tablet.” MDS Manager™ does not replace the electronic health record, but it allows patients to keep track of all their symptoms and treatments in one convenient portal. MDS Manager™ also provides links to vetted online information resources and will send alerts and other relevant links to the users based on their choices. 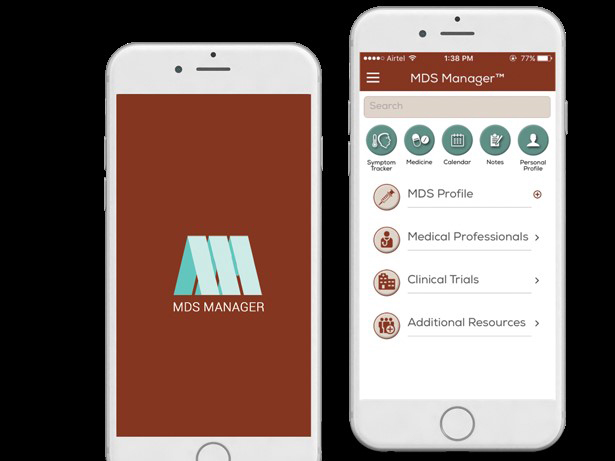 MDS Manager™ is available for download on IOS and Android formats. To test the feasibility and usability, Kurtin, a nursing PhD candidate, is evaluating the use of MDS Manager™ to improve communicative health literacy and health self-management. Of the 11 patients and caregivers (age 56-83) who participated in a pilot study, feedback was positive and their suggestions have been used to improve usability. An expanded study using MDS Manager is the focus of Kurtin’s dissertation. Working with The University of Arizona Biostatistics department, and an mHealth app development company, Kurtin has been able to create a virtual platform for clinical research, allowing collection of both individual and aggregate data via the mHealth app. A study web-site and Administrator dashboard allows for real-time monitoring of the data. In the future, Kurtin hopes to develop similar mHealth apps with database connectivity and study web-sites for different conditions.